Like my sister, I grew up at craft shows. My parents’ business began when I was about a year old. Being so young around all of the fabric, wood, paint, and hot glue I was not a lot of help. I was only given truly important jobs, like hugging every single stuffed bunny my mother made. With so much influence and such important jobs, it is no wonder my first quilt was finished when I was about 14. It was a nine-patch (like my sisters, common theme?). 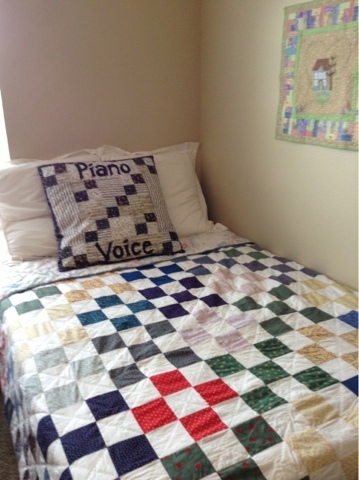 I also quilted it by hand, but I used a large embroidery hoop rather than traditional quilt frames. I did not do a lot of sewing during my teen years other than this quilt, but it definitely left an impression on my future of sewing and crafting. Now as a wife and mother, I enjoy making things for my home, my in-laws, and of course my husband and daughter. I like to do things myself (after asking my mom if it will work) and I am no longer afraid of my sewing machine.